ISLAMABAD, April 15 (APP):Pakistan is open for investment and tourism as visa policy has been revamped, terrorism checked in its tracks and the security situation has improved a lot in the country. 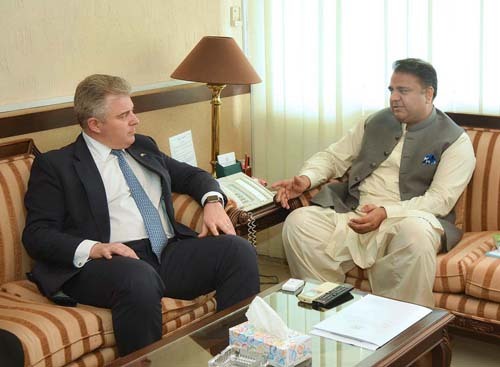 Federal Minister for Information and Broadcasting Chaudhry Fawad Hussain said this in a meeting with the British Cabinet Minister and Chairman of the Conservative Party, United Kingdom (UK) Brandon Lewis, who called on him here on Monday. He said Pakistan enjoys cordial and longstanding relationship with the UK and would like to further strengthen these bilateral ties in areas mutually beneficial for the people of both countries. “We welcome film makers and tourists from all over the world to come to Pakistan and explore the scenic beauty of the country, particularly of its northern areas,” he said. The minister said Pakistan Tehreek-e-Insaf government accords top priority to the promotion of culture through films as they are vital medium to project values of any society. He said efforts are underway to revive the film and entertainment industry of the country which once was the third largest film producing entity in the world. Responding to the question of British cabinet minister regarding growing importance of social media in comparison to broadcast media, Fawad said the government aims to solidify digital wings of information ministry and is working on the project of digital service for Associated Press of Pakistan, which is the state-owned news agency. He also emphasized the need for global efforts to counter hate speech on social media. Brandon Lewis said there is potential for the UK companies to invest in Pakistan. He was accompanied by Bestway Group Chief Executive Officer Zameer Chaudhry.